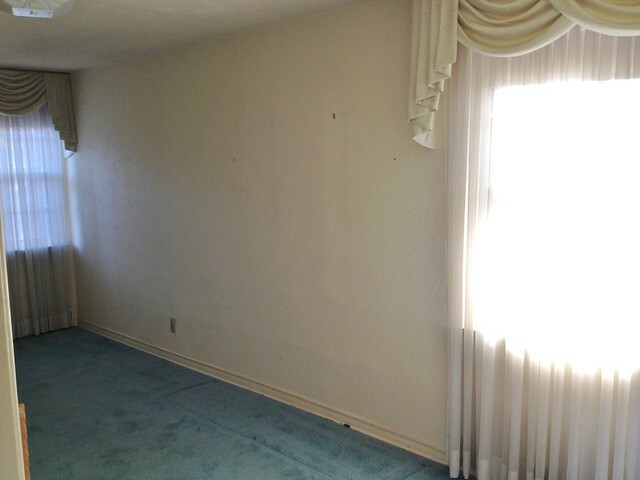 This is the last stop on the “after” tour of our 8th flip! Just in time, because we officially sold the house yesterday – yippee!! In case you missed them, you can check out the befores and afters of the exterior here, and the first floor here and here. Here we go. At the top of the stairs there is a little hallway – from this point of view, straight ahead are two bedrooms, to the right is the guest bathroom, and I’m taking the picture from the master suite. Let’s go check out the bedrooms, shall we? The first bedroom faces the street and has lots of funky angles – depending on your point of view, the quirkiness is either charming or it isn’t. That’s something we learned with this house – quirkiness can be good or bad, just depending on the buyer, so try to avoid quirks when flipping houses so that it appeals to the largest number of people. Sad face. Directly opposite the front bedroom is the second bedroom, which overlooks the backyard. 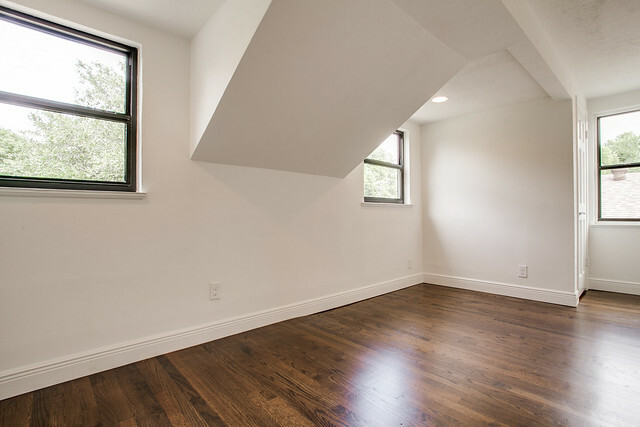 Fun fact – these wood floors on the second floor are all original!! 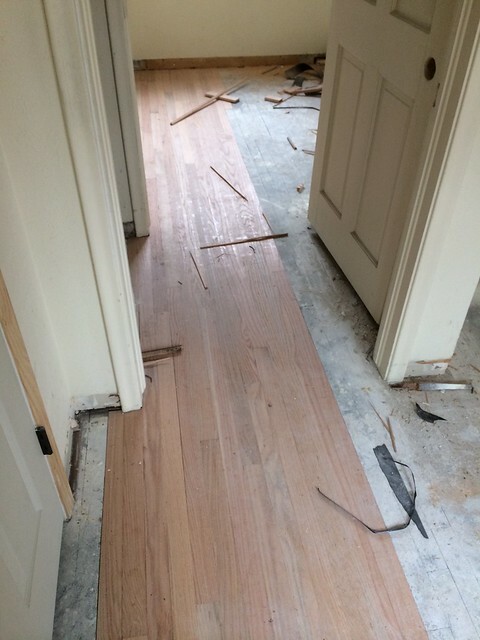 I thought it was just a nasty subfloor, and I have never been happier to have been proved wrong. We just had to have them patched in a few places, and I think they turned out really great! 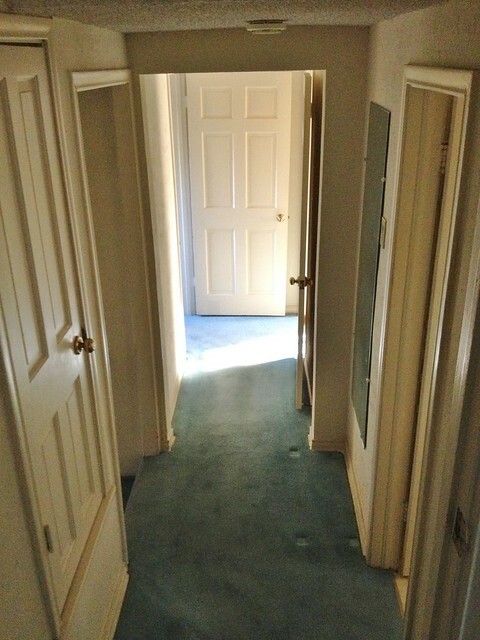 Another fun fact – the way the house was originally built, you could only open the door to one bedroom at a time, or else they would hit each other and you could literally get stuck in the hallway or in a bedroom. That, my friends, is a bad quirk. You can kind of see in the photo below that the bedroom doors (in the background of the photo) don’t really play nice with one another. 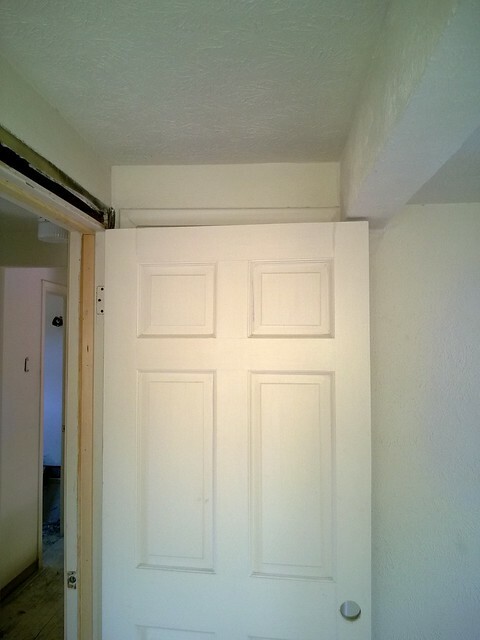 Luckily this quirk is one that we were able to fix by changing the swing of one of the doors, and shrinking it a bit so that it would swing under a support beam. Good times. I’m totally in love with how it turned out! This is the first time we’ve done tiled wainscoting and it’s definitely going to make an appearance in future houses. 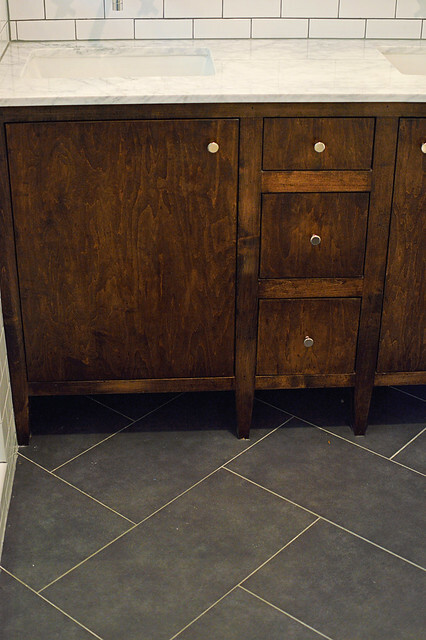 We also tiled the entire wall behind the vanity. This terrible photo below is the only one I could find that shows the light fixture – it doesn’t really look that amazing in this photo but in person it’s killer. 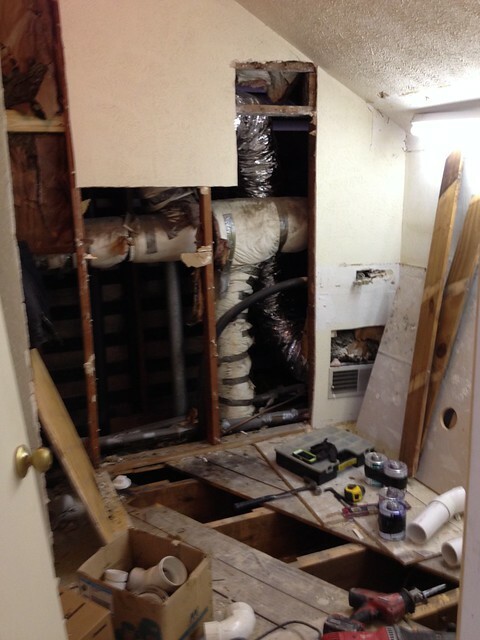 Oh, and remember how we had this fun surprise when we removed the vanity? 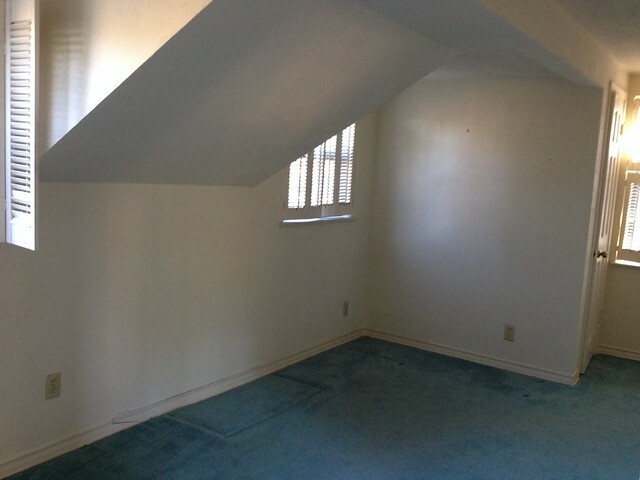 A master suite that originally had sparkly popcorn ceilings. Unfortunately the glitter isn’t quite catching the light in this photo, but I can assure it was there. 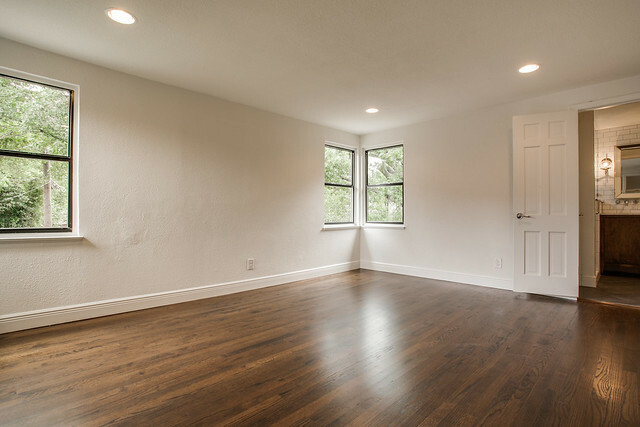 We opted for recessed lighting instead of fixtures in all of the bedrooms because the ceilings are on the low side – but now the rooms are all nice and bright! 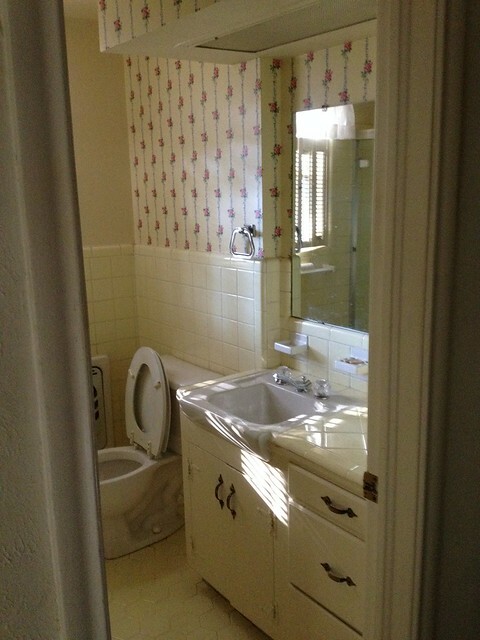 A small bathroom is connected to the master bedroom, and it was really terrible. 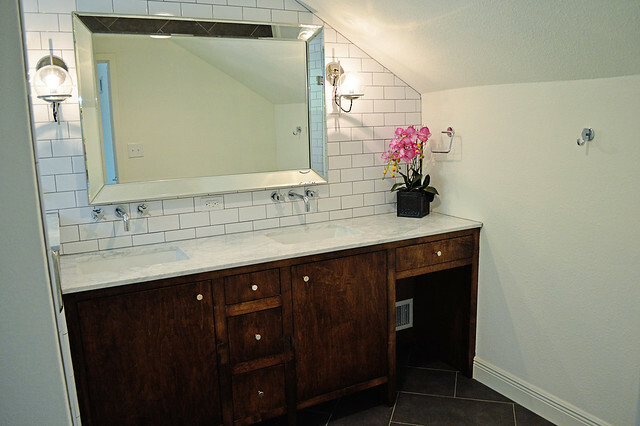 The ceiling has a slope that makes placement of the vanity and shower really tricky. Luckily, I think we figured it out and made the most of the space. 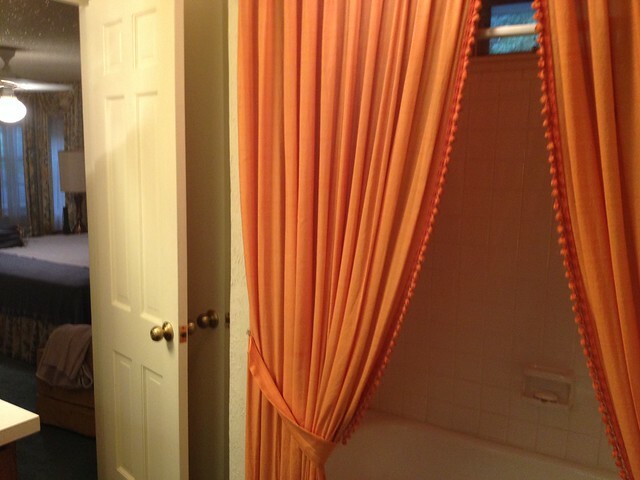 The shower stayed in its original location but we changed it from a tub to a walk-in shower. 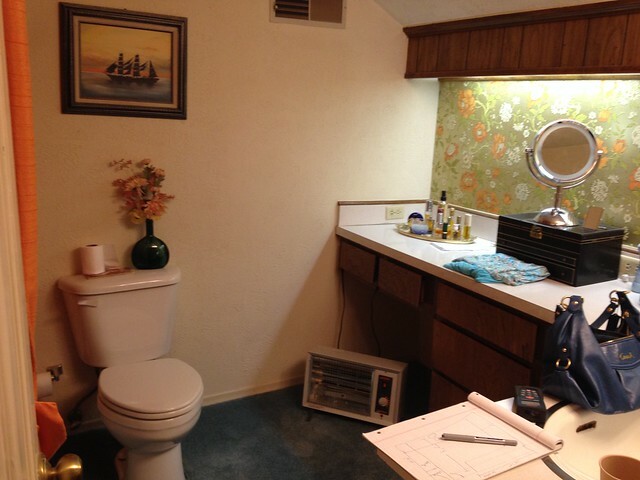 The vanity moved completely, and we added a little makeup area at the end so that the sloped ceiling made some sense (which we chatted about here). 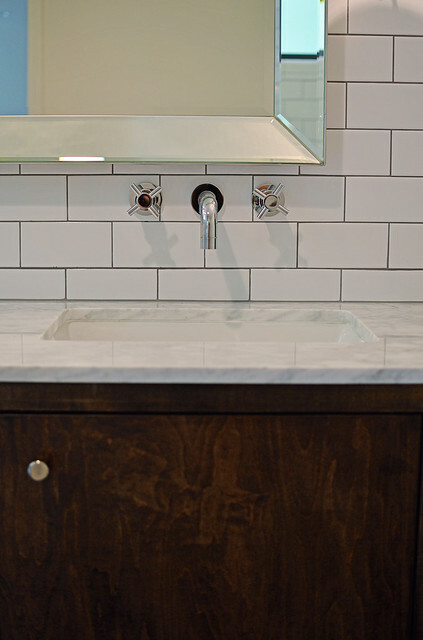 The grain in the vanity shows up more in the photo than it does in real life, and I’m really, really happy with the way the vanity turned out (even after my near meltdown when the painter prepped the vanity for paint instead of stain). We tucked away the shampoo niche into the pony wall so that all of the showering necessities are hidden from sight. Here are a few close up shots for you guys. 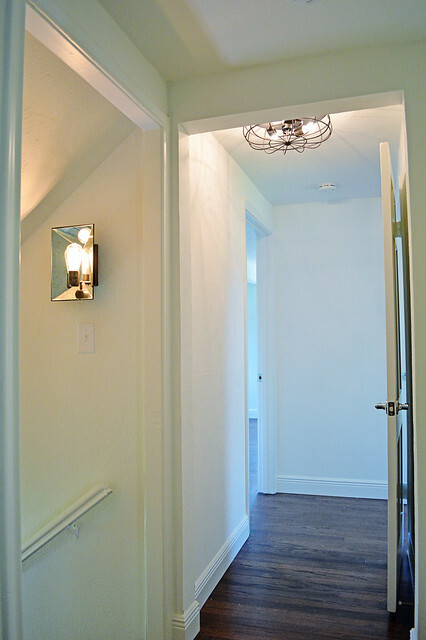 The electricians were baffled by the sconces, but they thought they looked really cool – me too! And the herringbone floor is definitely something that turned out spectacular – we’ve already repeated it in the kitchen of our 9th flip, and the kitchen of one of the rentals that we bought this summer. We made the window as large as we could (there is a vent on the roof right outside the bathroom that we didn’t want to see from inside) and it definitely lets more light into the space. 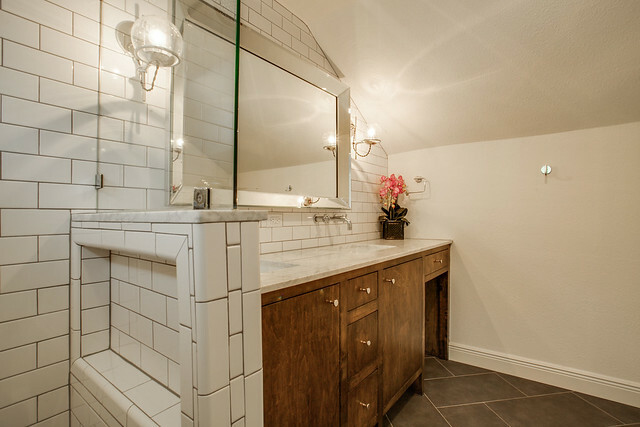 If I had to pick a favorite part of the house, it would definitely be the master bathroom. It turned out just as I’d hoped. And that’s it!! The 8th flip is done and gone – how do you think it stacks up to our previous flips? Looks fantastic!! I can hardly believe how far it’s come! How large are the tiles? I’m helping my parents with their master bath, and love the herringbone pattern, but not sure if we can pull it off with the size of the tiles 12×24). 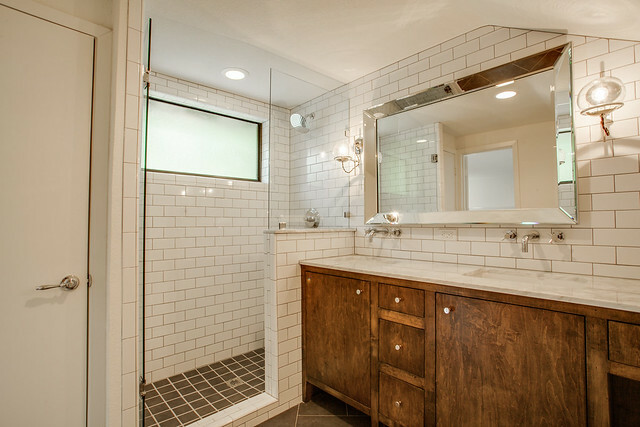 Okay, I LOVE that master bathroom! What you did is phenomenal. And putting the niche behind the pony wall? So flippin’ genius! Congrats on the sale and I can’t wait to see #9 when you get to it. This flip is AMAZING! I love it. I would definitely live in this house if I had the opportunity to. 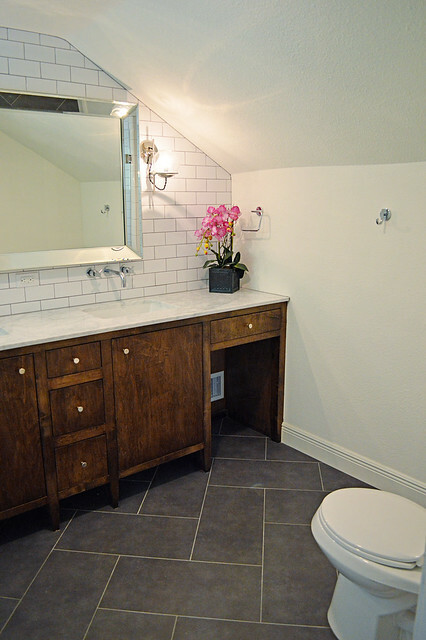 The hardwood flooring works perfectly with the house and the bathroom wainscoting looks fabulous. GREAT JOB. What a difference! Come flip my home. Everything took a 180 turn! I really love how the bathrooms came out specially the bigger one with that gorgeous mirror! Such an amazing transformation!! 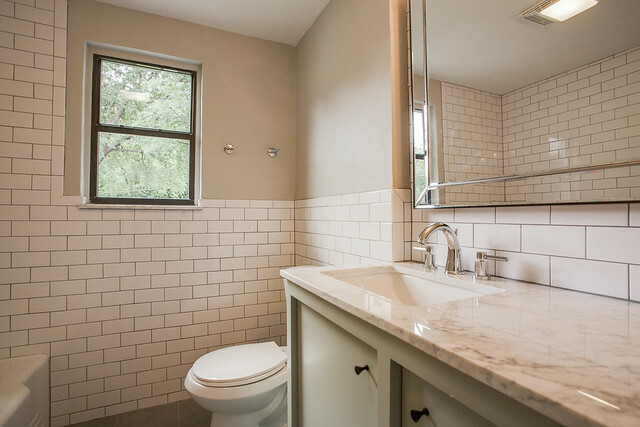 Love everything, especially that master bath!! And I have to ask, where is the big mirror from?? It is just what I am looking to put in my bathroom but can’t ever find one like this! I like quirky too and love the angles in the bedrooms. Would be fun to furnish! You guys do great work and what a fun way to make a living! Wonderful! You have done it again. Congratulations to you both! Love how it turned out. 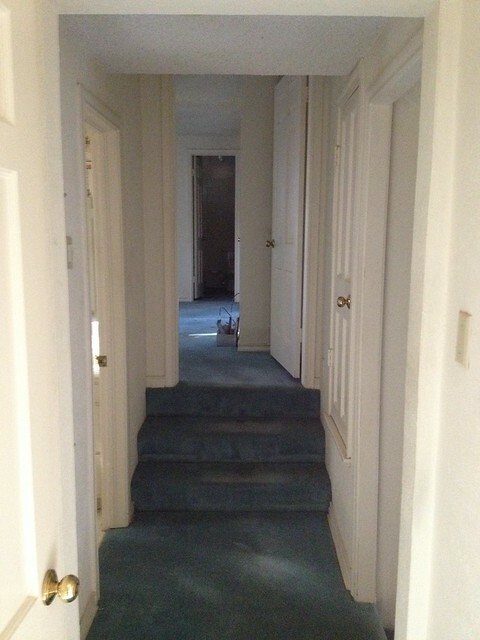 The upstairs door situation was dreadful, but you worked it out. Love the post! Congratulations of the sale!! It came out beautifully!! 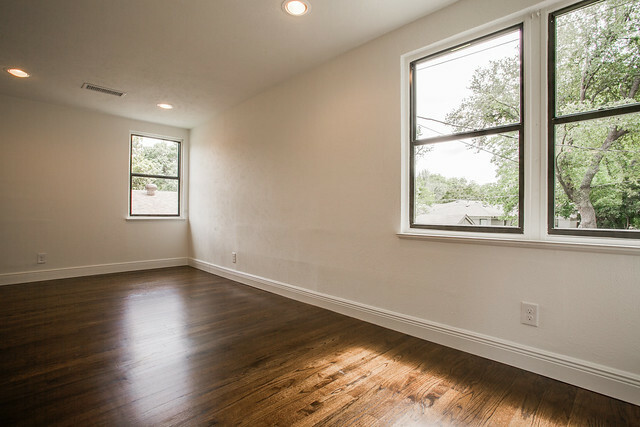 How great that you got to use original floors… the refinishing looks amazing! 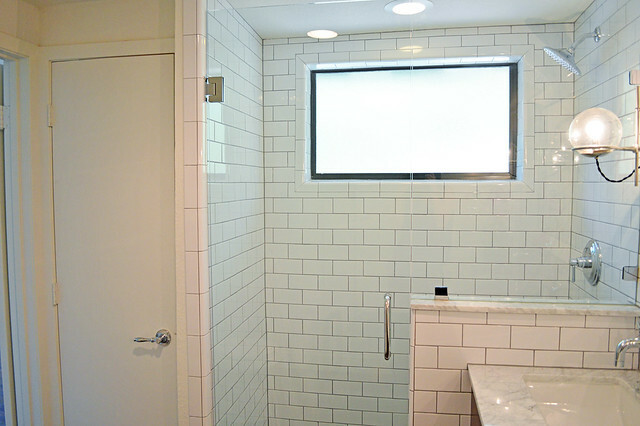 I think my favorite part of the bathrooms are the beveled mirrors… they are just striking! The fixtures look really great, too! 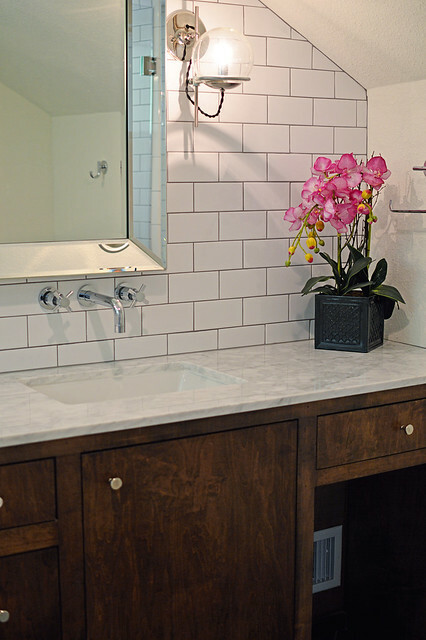 Did you use Carrera marble again for the counter tops? 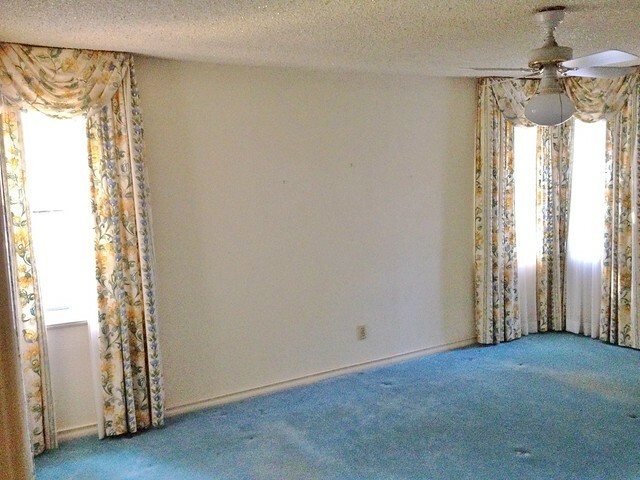 Hello, did you remove the glittered popcorn ceiling or just paint over it?